While 1080p (HD) resolution is just fine, Zwifting in 4K (UHD) resolution is an incredible experience. At four times the resolution of 1080p, 4K gives you a much sharper, high contrast picture that clearly picks up the finest details in the Zwift universe. 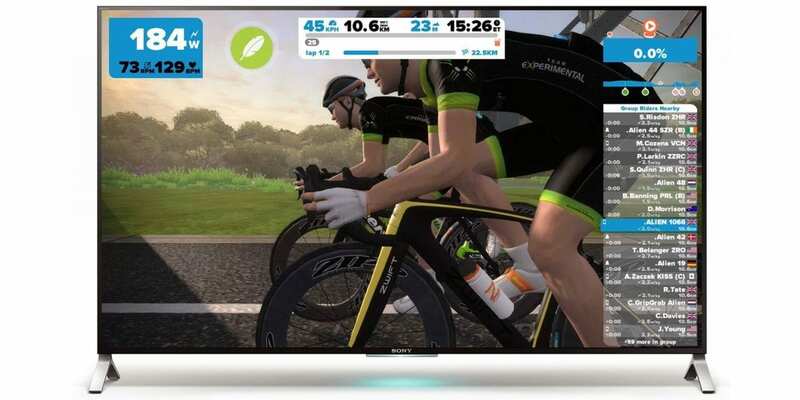 In addition, this large resolution increase allows you to Zwift twice as close to a 4K TV than an HDTV which may be important if your pain cave is small. Zwifting in 4K will not make you faster or stronger, but once you try it, it’s hard to go back. The most important component for Zwifting in 4K is the GPU, which runs the graphics. The two biggest GPU manufacturers are NVIDIA and AMD but the latest generation of NVIDIA GPU cards (the 10 series) is a giant leap forward in performance. Surprisingly, while the CPU performs important Zwifting functions, most current and previous Intel i3, i5 and i7 desktop CPUs with clock speeds above 2.5 GHz should work just fine in 4K…so long as the GPU is fast enough. This is great news for those with older gaming computers which can be converted into powerful 4K Zwifting machines with a simple $200 GPU upgrade. Just make sure the computer’s power supply is beefy enough to handle the new GPU. Which GPUs are fast enough? Analyzing data from Zwiftalizer, here is a list of the latest GPUs capable of Zwifting in 4K. * your average FPS is limited to the Max FPS (or Hz) of your TV. ** While the 1050 and 1050ti GPUs will work in 4K, the 1060 is much faster for only $50-$80 more. Although deals come and go, you can usually get a great price on an open box, refurbished or leftover gaming computer at Newegg.com. For example, in May 2017, Newegg was selling an Open Box CyberPowerPC gaming computer with Intel’s latest i5 CPU and AMD’s RX 480 GPU for $700. This is a steal and will run Zwift beautifully in 4K. Jonathan is a 53-year-old Connecticut car dealer, married father of three, Michigan Wolverine, computer geek, Jarvis Island beta tester and middle of the road Zwift “C” racer.